To restate, the biggest challenge facing many cities in transitioning to the knowledge economy is a shortage of “A” talent, especially true superstars. I dealt with superstars like Jeff Bezos in my last post. Today I talk about “A” caliber talent. What’s the difference between the two? It’s arguably a continuum in some respects, or depends on how finely grained the domain. But the superstars are the true world’s best, particularly at something that generates economic growth at regional scale. But beyond those rare few, there’s also a shortage of just the top level talent that makes cities and organizations go. When I started as a staffer at Andersen Consulting, I noticed right away that every department at my clients tended to have one or two people who really made the place go. For example, at one client there was a guy in networking named Phil. When I met him, he wasn’t even a manager level person, but you could tell he was just a cut above everyone else and was the go to guy for many things. I wasn’t surprised to see that years later he was running networking for a Fortune 5oo company. This ability to be the person that makes it happen, or some equivalent level of impact, is what distinguishes the A player. One of the things that’s most impressive about New York is just how many A level people there are – way more than anyplace else I’ve ever lived. But even people under Dan in the org chart are still top notch. 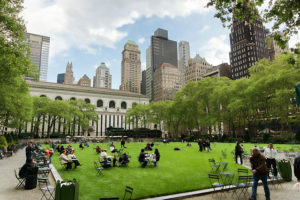 Andrew Manshel, who used to work at Bryant Park, runs a great web site called the Place Master, with all sorts of finely detailed information about how to create great public spaces. Mostly likely, in almost any city in America, Andrew would be the #1 guy in town in placemaking. Of course I’d be remiss if I didn’t mention that Bryant Park’s design drew on input from William H. Whyte, the godfather of successful small urban spaces. When you take a look at the talent that’s been brought to bear on just this one small park, you start to get an insight into what makes these global cities so successful. Smaller cities, say regions in the one to two million population range, definitely have A caliber talent. They just don’t have enough of it. This limits their bandwidth for making change. There are tons of opportunities in these places, but often not enough people with the capability level to really seize them and make them happen. Of course what makes someone an A player is context specific. For cultural mismatch or other reasons, many great people fail in one environment only to succeed in another. So it’s not a simple matter of moving pieces around on the chessboard. Nevertheless, if the quantity of these “make it happen” type people went up significantly, a lot of cities could see some serious results. Again, when it comes to attracting talent, in the present world you have to have at least some focus on creating or attracting A players and superstars. I’ll have some thoughts on that in a future post. Your comment “what makes someone an A player is context specific” invalidates the remainder of your article. A players play in A contexts. It’s the context. I have seen A level talent from a person who never graduated high school, but the largest cohort of top talent is where you expect it to be – the exceptional students of flagship universities. The problem is that these people on the whole are very risk adverse. They pursue well worn paths in success and status. That is why they all flock to major metros espcecially New York and the Bay Area. When Cleveland is a big success they will flock to Cleveland. Now in 1991, or 2001, or 2008 or the next recession a city like Cleveland or Indianapolis could have put funds aside to hire a thousand people who would usually be in New York, Chicago or a top grad school. There is no doubt that some of these people would morph into A level talent. But this raises another question. Is there space for these people? I imagine a small metro doesn’t have a thousand interesting/plum jobs that can be given to outsiders during a recession. Who would hire this potential A-level talent? What would they do? Once hired what would be their incentive for staying? If an area does not offer opportunities, products of good schools leave. That is a quintessential American problem;because suburbanization fueled by special districts has created a culture of abandonment. Low ROI. As soon as housing begins to wear move on. Meanwhile debt still outstanding. so “$500 million in bonds” plus interest, for an 82 acvre tract of land. Gee yo9u think homeowners taxes will pay this off? I think Bryant Park and the much touted improvements in NYC are actually equivalents of ‘lipstick on a pig’.. Outsize amount of focus on small part of the city. Quality of life has fallen because people have to share apartments. The city desperately needs to decentralize. I used to live in NYC. I have lived on Upper East Side and near Grand Central. I was shocked when I visited Queens and Brooklyn. Seemed like belong to a different city. For me NYC actually is one of the more livable areas of the US. Because I am one of those people who do not like driving. For me the shorter the commute the better. But transit is best in Manhattan. Ever since consolidation, the orientation of the city management has favored Manhattan. And even in Manhattan, you can see some parts are more well kept than others. Do you know how high re-election rate is in municipal elections and how low voter turnout is? Some voters actually get so fed up they leave. Data from survey of 4 largest metro areas revealed people left cities for primarily dissatisfaction with services and low electoral turnover. But then they go from frying pan to fire. Costs rising faster than revenues, tax base declining, states cutting back on aid portend hard times for suburbs and their limited tax bases. I think much ado about knowledge economy. R & D productivity has been declining in US for over 30 years! There is declining middle class and rising poverty despite the knowledge economy. Manufacturing has been declining since the 1960s.